Want to get others on board in your deslobification process? I’m sharing the ways I’ve found that work, but also (and probably more importantly) the mindset issues that are important when this is your goal. After a year of profound clutter abatement (still not done!) I now find my husband getting on board and doing clutter reduction independently. He was very reluctant and was definitely “you go first” which I did. Watching it week after week had an impact. I just recently found your blog/podcast and have been listening “backwards” as you say. But the recent posts always download and I end up listening to them too. I was so glad to hear this one because that is one of my big hangups. I don’t want to be the only one cleaning the house with a husband and three teenagers. But being a slob too, I listened to this and realized that I had unrealistic expectations from a family who had seen me not cleaning either. I am working on myself and they are joining in. It’s been great. 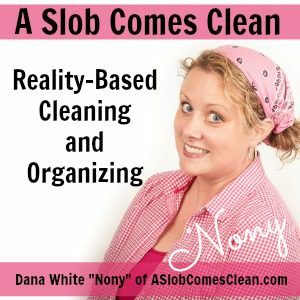 Thanks so much for helping me get a paradigm shift on cleaning through your podcasts and blog!